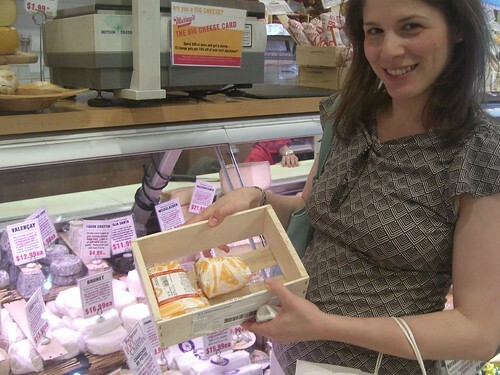 The fourth and final installment in our New York Summer ’09 cheese tour — though we’re already counting down to our next visit. 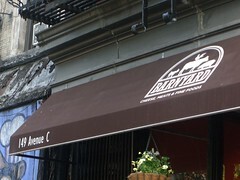 I actually heard about Barnyard first on Twitter, and made a mental note to add it to our chzday09 adventure. When we staggered across town from Murray’s to Barnyard’s front stoop, we were frankly a little tired and cranky and more concerned with resting up for dinner than with looking at yet another cheese case. So we were almost relieved when we didn’t spot any cheeses from the list that we hadn’t yet sampled. Had this been our first stop of the day, we likely would’ve spent more time chatting with the friendly staff in this inviting, yet cozy, neighborhood shop. While the selection was not abundant, Barnyard did have a noteable array of foreign and domestic picks that ranged from the classics (Beemster, Roquefort) to newer and regional choices (Roaring 40s, Consider Bardwell). They also make (and deliver!) fresh deli sandwiches and soup, and offer all the critical cheese complements from olives to crackers, plus some farm fresh eggs and meat products in the deli case. While I may not make a special trip over just to visit the shop, I’ll be certain to poke my head in should I find myself in the neighborhood. And if you’re in the neighborhood, be sure to peak around the corner at their affiliated wine shop for something else to take home with your cheese. (That’s the pecorino on the right, gabietou on the left.) Incidentally, while labeled foglie de noce in the shop, online Murray’s lists this cheese as “foja de noce.” A traditional raw-sheep’s-milk pecorino, this hard cheese is crumbly but not sharp, sweet and lightly salty, with muted grassy, earthy, almost woodsy notes from the walnut leaves the cheeses are layered with to age, after being “bathed daily” for three weeks. It has just a bit of the trademark oiliness of sheep’s-milk cheese, but smooth-flavored all around. A lovely cheese for snacking, I took this one on a second picnic date with my son where we enjoyed the leftovers with some fresh-picked Virginia raspberries and blackberries. I’m thinking it would be a great dessert with some sweet wine and yes, lots of summer berries. Colleen and I ate a lot of goat’s-milk cheese while we were in New York, and one of our favorites was Chabichou du Poitou. 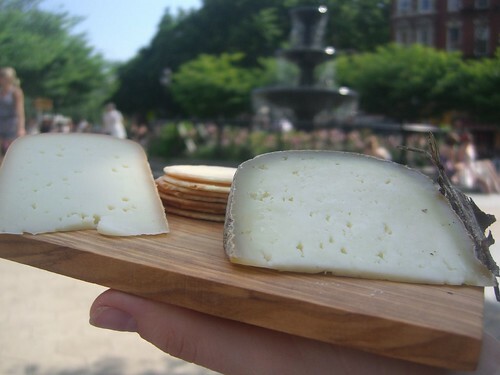 We picked it up at Murray’s and enjoyed it in the nearby park where we staged our outdoor cheese photo shoot. Remember, this was Pride weekend, so a cheese photo shoot was likely the least unusual sighting in New York that day. 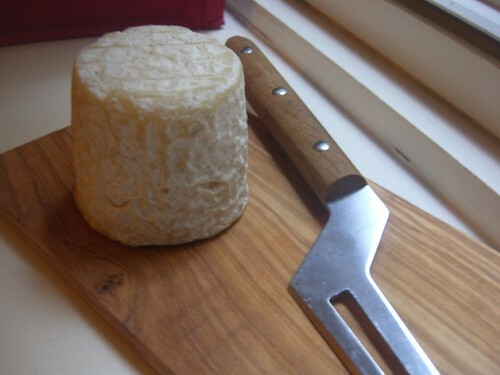 A relatively young cheese (aged six weeks), Chabichou must be made from pasteurized milk to be imported to the United States, and I can’t say the pasteurization detracted from its taste. Though it had the typically goaty smell, the paste wasn’t too goaty. Instead, it was firm and chalky with notes of flowers and grass. Chabichou is AOC-protected, which guarantees that the cheese you by with this name will have come from the Poitou region of France. It’s a good cheese to seek out if you don’t think you like goat cheese – its clean flavor may convert you! Of course, wines from nearby Loire Valley would make an excellent match for Chabichou. Artisanal recommends Pouilly-Fume, Sancerre, Muscadet and Sauvignon Blanc. The more the cheese matures, however, the more likely it would pair well with a red wine. 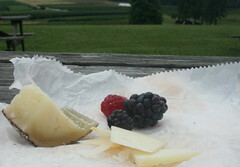 The third in a series of tasting notes from our New York Summer ’09 Cheese Tour. Though chzday09 actually took place on Sunday, June 28, Colleen and I did a practice run, so to speak, in Brooklyn the previous day. After spending some time at the Brooklyn Children’s Museum with the extended dccheese family and feasting on pastrami at Junior’s Deli, we made a quick stop at Stinky Brooklyn before I headed into Manhattan and Colleen went to the No Doubt concert at Jones Beach (lucky!). A slip of a shop in the Carroll Gardens neighborhood, Stinky Brooklyn nonetheless packs in a large variety of cheeses, meats (you can’t miss the selection of hams with hooves still attached) and all the classic accompaniments into its four walls. While the bus of visiting cheesemongers in town for the Fancy Food Show made the shop very crowded, we managed to squeeze our way in to pick out a couple of cheeses from the Wine Spectator list that we had yet to sample. 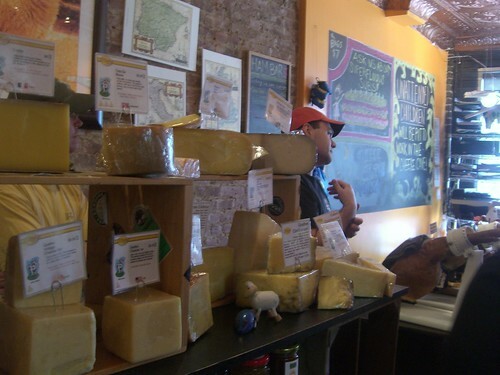 Colleen and I usually like to take time to chat with the cheesemongers, taste a few (or several) cheeses and poke around the non-cheese items, but the volume of hungry customers made it impossible this time. Hopefully, we’ll make it back another time for a more leisurely visit and tasting session. 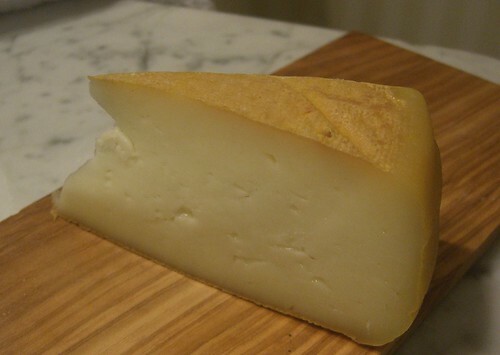 We were excited to see one of the two Portuguese cheeses on the list at Stinky Brooklyn – Nisa, a raw sheep’s-milk cheese made in the country’s Alentejo region. A creamy, yeasty cheese, Nisa seemed lighter than the Gabietou, though it had a similar consistency. We noticed a less pronounced “sheepiness” (i.e. oiliness) to the cheese but still enjoyed its drier texture and herbaceous flavor. Being Portuguese, Nisa is a can’t-miss match for Port or a light-bodied red wine. Let’s get the disclaimer out of the way first: this is not an unbiased review. We first met Tia Keenan, mistress de fromage, virtually via Twitter. It was love at first tweet as we instantly sensed a kindred spirit in cheese. 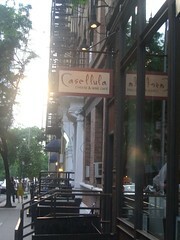 So when Jill and I realized the stars would align for us to meet midsummer in New York, Casellula was top on our agenda. On a night when the biggest and brightest of the professional cheese trade were in town, many also visiting this intimate cheese and wine cafe, Tia was a warm hostess and generous with her time and talent. As cheese junkies, it is futile to ask what kind of cheese we like best. Would you ask a mother to name her favorite child? Well, right now we can, but that’s only because we each have only one. But back to the point, we prefer to do the asking when at a cheese shop or ordering a cheese plate, and our best finds are often those when we relinquish control and let the cheesemonger surprise us. This was certainly the case at Casellula, where we selected the New York flight as the most likely to contain cheeses we weren’t familiar with, and were delighted when Tia made a few adjustments for us. New York’s 3-Corner Field Brebis Blanche (so fresh!) 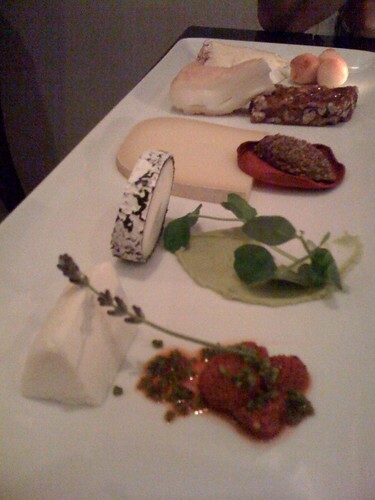 and Red Meck were certainly delicious, but we were totally smitten with the Pipe Dreams chevre log and sweet pea puree pairing. Lazy Lady Farm’s Bipartisan, a fresh goat cheese ball dropped into a washed-rind cow’s-milk cheese, was a most welcome treat. The cheese plates Tia lovingly prepares are truly inspired, with pairings ranging from a typical mustard to pickled ramps and coconut macaroon balls. While the rest of our trip was meticulously documented in photos, tweets and tasting notes, we declared ourselves off duty and simply savored our wine, cheese, plate of fresh anchovies with fennel and pickled shallots, blue cheese-laden endive salad and mouth-watering desserts. So we can’t tell you what wine we drank, other than that it was a lovely full-bodied white Czech tokai, but we can tell you that the parsnip cookies with Pipe Dreams chevre filling are simply not to be missed. Aside from that, entrust the wine suggestions and cheese selections to Tia’s capable hands, and you’re sure to walk away refreshed and inspired. The second in a series of tasting notes from our New York Summer ’09 Cheese Tour. 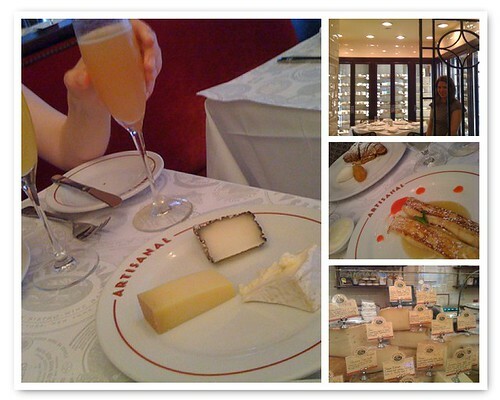 After brunch at Artisanal, we headed downtown to do some shopping, cupcake-hunting and, of course, more cheese-eating. Our next cheese-shop stop was the one I had been looking forward to the most, not only because it is considered one of the best cheese shops in the United States, but also because it shares a name with my grandfather. Murray’s in Greenwich Village did not disappoint. Murray’s began as a wholesale butter and egg shop in 1940, when it was owned by Murray Greenberg, who, according to Murray’s Web site, was a Spanish Civil War vet and Communist. 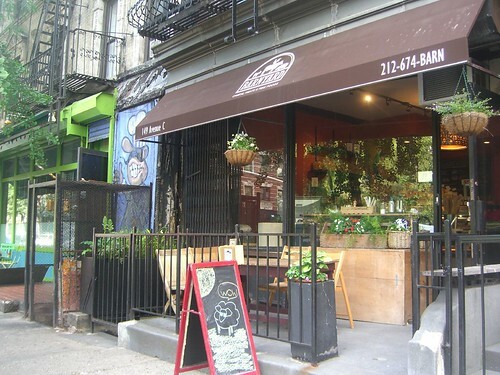 He sold the shop to one of his clerks in the 1970s, and it is now owned by Rob Kaufelt, who has since moved the shop twice and turned it from a bodega-type shop to one specializing in artisan cheese, charcuterie and the like. Squeezed into a narrow space on Bleecker Street, Murray’s nonetheless has an impressive variety of domestic and imported cheeses, including several that neither Colleen nor I have been able to find in our local cheese shops. The cheesemongers are generous with samples (always a plus in my book! ), and the one who helped us took a keen interest in our blog (hello, if you’re reading along!). 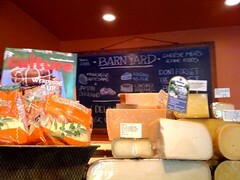 I'm like the Vanna White of cheese. Yeah to Murray's for getting into the Pride spirit! 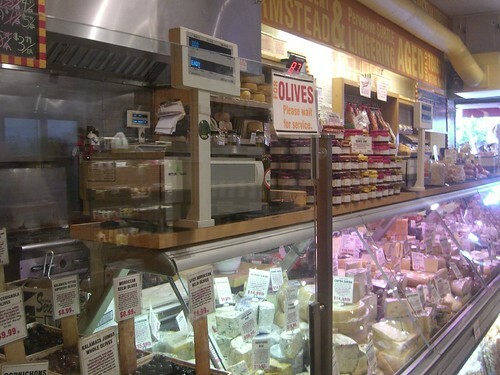 The cheese lover could easily spend an hour wandering through the store and browsing among the meats, breads, crackers, chocolates, olives, butters and such. We happily picked up a Murray’s insulated tote (essential because our hotel room did not have a fridge) and a brutal-looking cheese knife that I didn’t dare try to bring home on the plane. The C+C kids, O and N, proudly sport Murray’s T-shirts with the phrase “milk made” printed on the front, while Colleen and I have joint custody of the tote. One of the cheeses we picked up at Murray’s was Gabietou, a French cheese made from a blend of raw cow and sheep mik in the Pyrenees. Being an imported raw-milk cheese, it has to be aged past 60 days, and most wheels you’ll find in the United States are aged anywhere from four to 12 months. We enjoyed the dense, creamy paste and how it melted in the mouth. 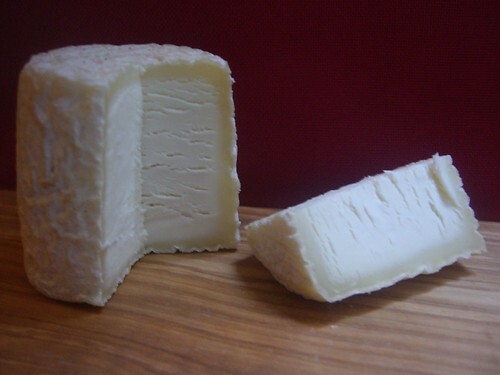 We found the Gabietou to be a little gamey but sweet at the same time, typical of many washed-rind cheeses. Beaujolais is a recommended wine pairing, though in keeping with the theory of terroir, I’d be apt to sample Gabietou with some wines from the Pyrenees region. 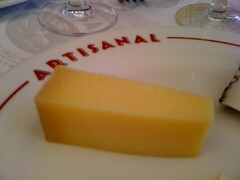 The first in a series of tasting notes from our New York Summer ’09 Cheese Tour. 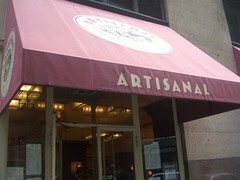 We made a quick stop in Brooklyn the day before, but our real day of cheese grazing (#chzday09) began Sunday morning at Artisanal Bistro in Midtown. As this was our first joint cheese expedition in NY, we started by visiting the classic landmarks. We got some great tips from new friends for our next visit, and the day culminated in a truly inspired dinner at a new favorite spot. You’ll have to stay tuned for that review, however. Back to our brunch. I had been to this original Artisanal bistro several years ago, and while we were tempted to check out the newer Bar Artisanal we decided to stick with the classic this time. While the food was satisfactory, the overall experience was underwhelming. The service was indifferent at best, and the cheeses were well-cared for but served naked and forlorn on a stark white plate. We opted for the seasonal cheese plate and received two traditional European cheeses, Pierre Robert (France) and Monte Enebro (Spain), and one from our list, Thistle Hill Farm’s Tarentaise of Vermont. 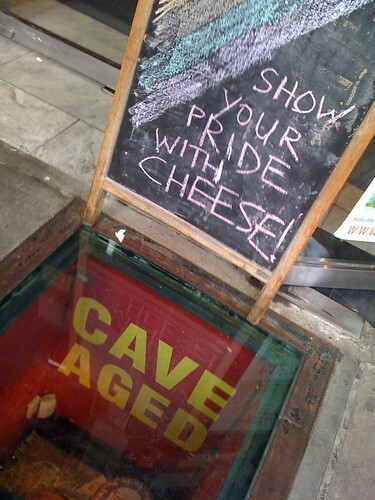 Of course we couldn’t resist peaking in to the well-lit cheese cave, where you can actually reserve a table to dine in the midst of the cheese. The cheese counter had a nice array of cheeses available for purchase. Thistle Hill Farm is an organic-certified small family farm in North Pomfret, Vermont. 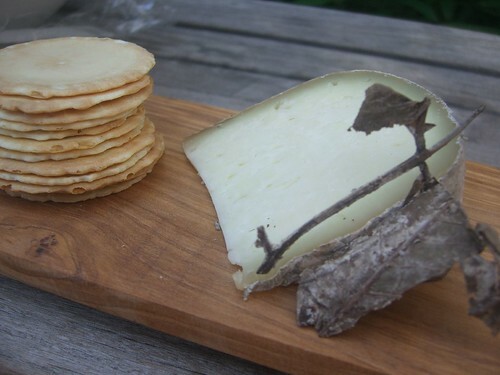 They use raw, organic milk from their herd of grassfed Jersey cows as the base for this Alpine-style cheese. Check out their website for the full story of their cheesemaking education. They use a custom-made Swiss copper vat and cultures imported from France in their labor-intensive process. The curds are scooped by hand, pressed and molded and then aged four to six months in an aging room used solely for this cheese. The finished cheese is very smooth, golden in color and meaty but sweet. It has a soft, full-bodied flavor with notes of sweet hay. 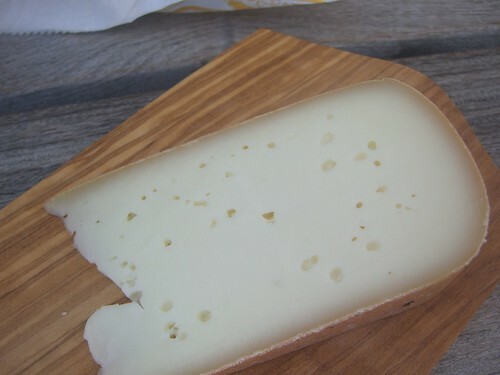 You’ll notice just a few of those crystals found in true Alpine cheeses (like Appenzeller). We found it too sweet for our brunch cocktails, but would suggest a medium-bodied red wine.